Anodised aluminium beakers are the ‘holy grail’ of collecting: everyone wants them. Here we have an original Robex-Hickok leather case [steer hide] with brass fittings – with its original steel bottle-opener. Robex-Hickok were renowned for their luxury leather luggage : but for a brief moment in the 60s they decided to produce picnic ware- for promotions. The original three beakers [shown left; blue, yellow & green] are marked; “Hickok, Positively Finer” on the base. Unfortunately the other three beakers are missing; but I have found some extras – the pink, yellow, orange and green beakers [shown right] – but they are unmarked, and have some scratches and dents. I am still hunting for the missing Hickok beakers – but maybe you have found them? 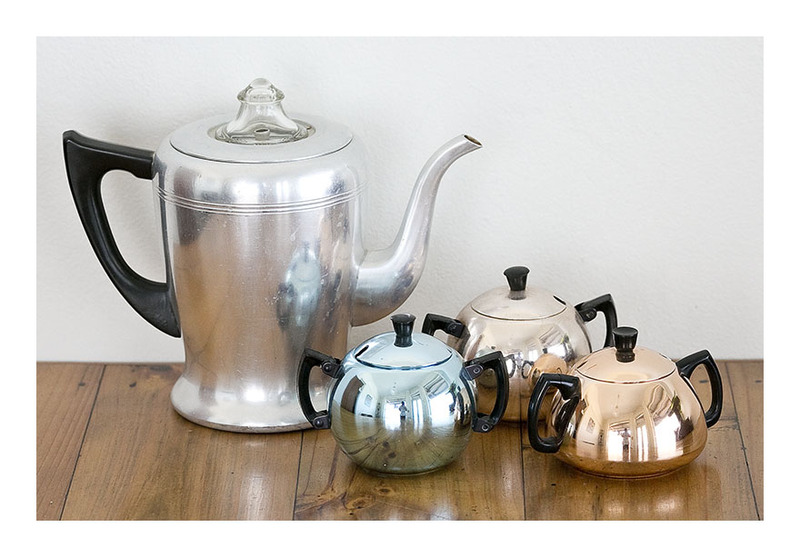 The three anodised sugar bowls are ‘Glamaware’- the name says it all! 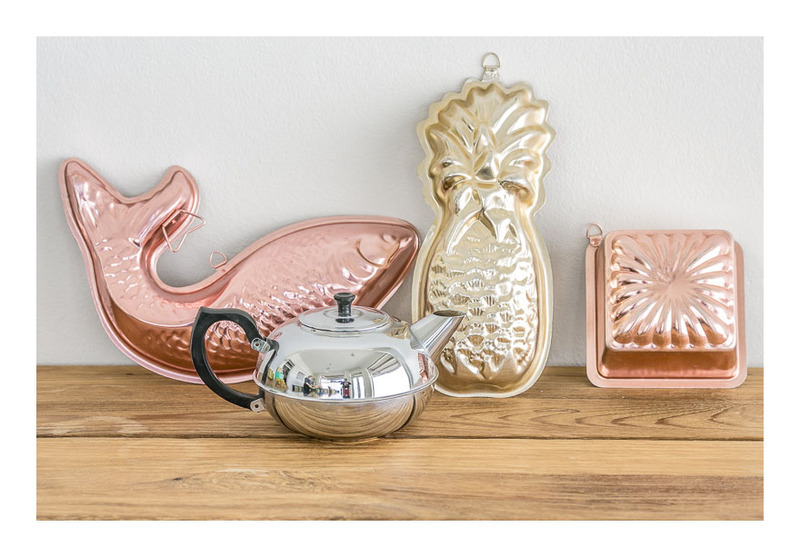 When I first started this blog, my lovely sister-in–law Pam gave me her Glamaware tea set and I used it as my blog icon, vowing never to sell it. 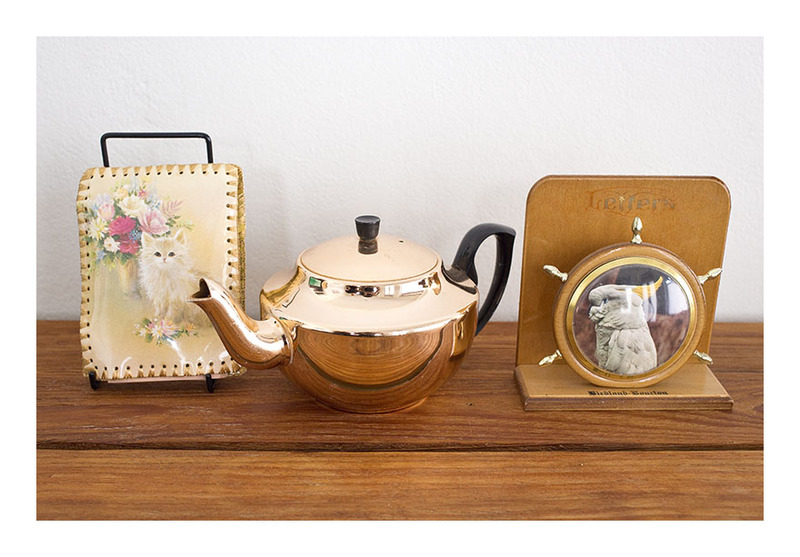 These three sugar bowls show the range of colours the sets came in: baby blue, gold and pink gold. If you zoom into the image, you’ll see my photographer son taking the photo. 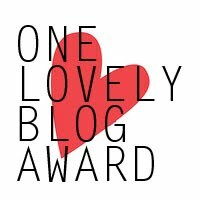 I quite like that he is finally being acknowledged for all his great photography work, albeit somewhat subtly. I found another set of anodised aluminium cups- they are unused and were still wrapped individually in 1950s tissue paper! This set from Hong Kong hasn’t a maker’s mark, just the place of origin…but they do come with a handy bottle-opener concealed in the vinyl case lid. 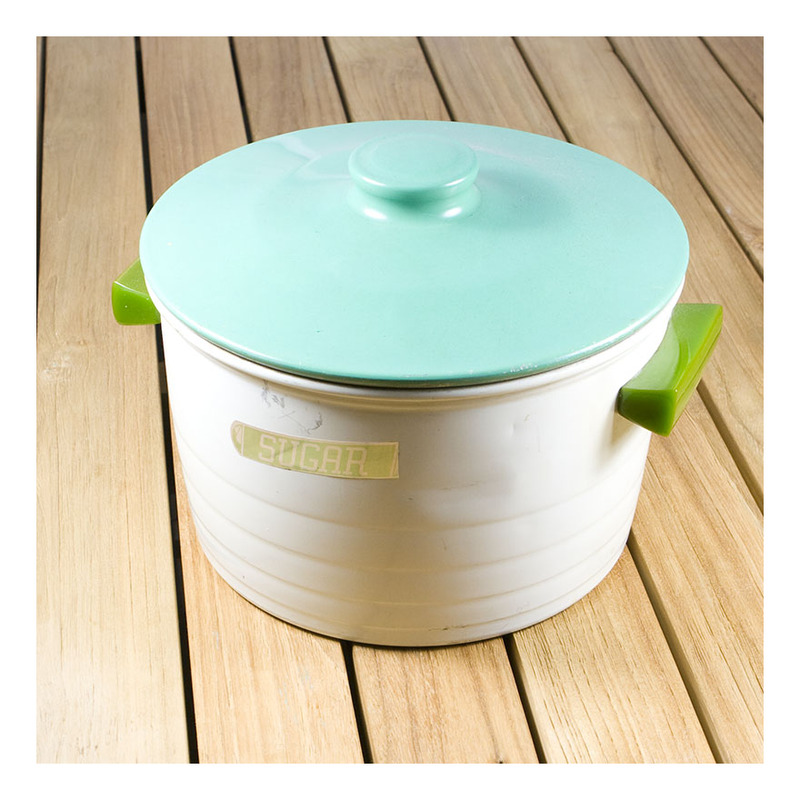 Perfect for the retro picnic! Aren’t those 50s colours adorable? This is a harlequin set- so called because there’s one of each colour. 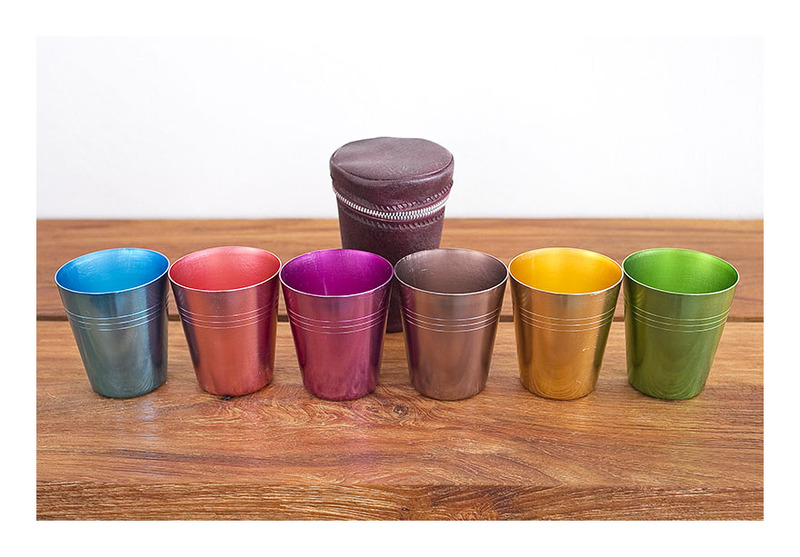 Anodised aluminium beakers are highly collectible- and I have sold a few sets. So many people have fond memories of the picnics of yesteryear. Perhaps it’s because picnics are such fun as children? No admonitions to get your elbows off the table, or not to speak with your mouth full. Happy Mardi Gras! It is if you are in Sydney at the moment. Hot on the heels of St Valentine’s Day -and quite appropriately too- it’s Mardi Gras. 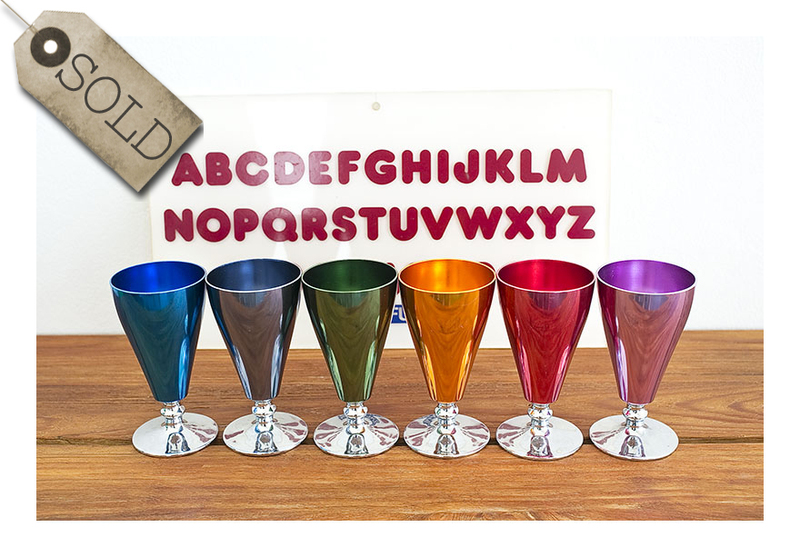 For all your rainbow-coloured needs, this set of harlequin anodised wine goblets -made by Fiesta! Ware – has never been used. Kept under wraps since the 60s, these goblets are now out loud and proud.